What is Meldonium-MIC (Meldonium) used for? 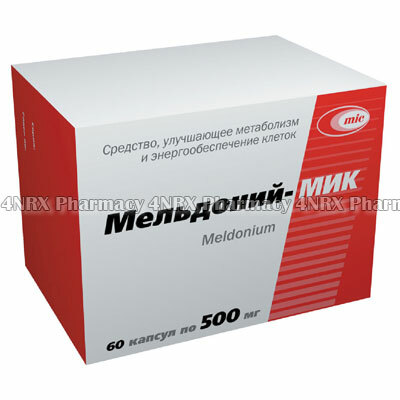 Meldonium-MIC (Meldonium or Mildronate) is an anti-ischemic medication indicated in the treatment of angina and myocardal infarction. It is also a nootropic, vasodilator and CNS stimulant that can help with cognitie enhancement. Meldonium is also a powerful sports performance enhancer that has recently been banned in international competitons. How should I use Meldonium-MIC (Meldonium)? Meldonium comes in two different packages. A pack of 30 x 250mg capsules or a pack of 60 x 500mg capsules. People using meldronium to enhance sports performance usually take 500mg-1000mg taken twice daily, usually taken before training. People taking meldonium as a nootropic (cognitive enhancer), often take 500mg in the morning and can increase this to 500mg twice daily if well tolerated. It is recommended to take the final does of the day at least 8 hours prior to bedtime. Dosages required to treat cardiac complaints will vary. Check with your doctor for dosage information. It is not recommended to exceed 2000mg per day. What are the side effects of Meldonium-MIC (Meldonium)? If you exprerience these or any other side effects while taking Meldonium, contact your doctor. The World Anti-Doping Agency (WADA) banned meldronium for use on January 1st, 2016. Use of meldronium can result in bans from your sport if you are tested. Do not meldonium if you are pregnant or breastfeeding. Safety in these groups has yet to be established. If you have any kidney or liver problems, tell your doctor about these before taking Meldonium. Meldonium can interact with hypotensive drugs. Tell your doctor about any medicines you are taking before starting Meldonium.